As you may know, one of the best ways to plug the leaks in your poker game and significantly improve it is to get the assistance of a third-party poker software. But choosing a poker software is no easy task, especially for newbies! How does it work? Is it compatible with your favorite poker rooms? Is it expensive? Whether you are a beginner or an expert, a Mac or a PC user, and whatever your budget, our guide will help you find the right Poker software. Insight on key game indicators. Before going more in depth in our review, you might want to understand what these softwares are used for and how you could benefit from them. 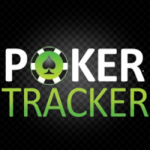 The Poker Trackers: These pretty complex softwares run in the background of your desktop while you are playing poker online and collect datas on you and your opponents to help you spot your weaknesses and then improve your game. They pull statistical informations together and often synthetize them into tabs or graphs. Odds Calculators: Odds calculators help players by giving them statistical information that would be difficicult for them to calculate on their own. The application runs while you play and gives you very useful insights on your chances to win at every stage of the hand. 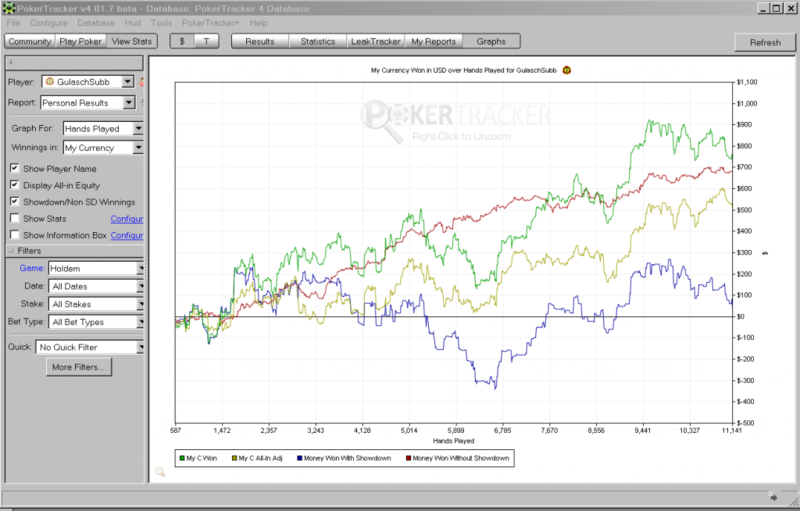 When you are looking at Poker softwares, two usually stand out from the crowd: Poker tracker and Hold’em Manager. They are amongst the most popular softwares for several reasons: they are well put together, stable and are constantly being updated with more features. Due to the sophistication of their settings, they are rather intended for advanced poker players. The main difference between Poker tracker and Hold’em manager lies in the heads up display – a tool positioning statistics over your online poker table – since it is far more advanced and customizable on Hold’em manager. Also, Poker Tracker might be a better option if you are not quiet an expert yet, as the “Community” tab offer lots of tutorial videos as well as a site configuration guide. If you’re only getting started with poker softwares, you will feel more confortable using either Pokeit or Magic Holdem. Pokeit is a poker tracking web-based application, offering similar features as the leaders of the industry: a hand browser, a report builder, smart graphs and a hand replayer. But thanks to its easy-to-use and intuitive interface, it is a pleasure to explore! 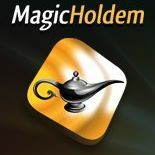 Magic Holdem is a poker odds calculator as well as your own personal poker coach. 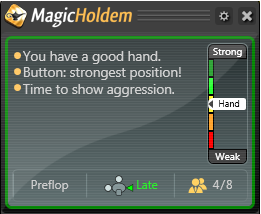 You can access many different poker rooms from the software itself and you will then get help from the Magic Holdem display: a small window evaluating the strenght of your hand and position to give you personalized advice. In terms of interface, Magic Holdem ranks first because it is uncredibly easy to use. Its accessibility makes it a great tool to learn how to integrate poker softwares to your game. Definitely the go-to software for beginners! Poke it is more sophisticated than Magic Holdem but succeeded in offering advanced features while keeping its design sleeck and intuitive. Also, as it is web-based, you can access it from anywhere and don’t need to download it. It is a great intermediary tool before moving to upscale softwares like Hold’em Manager and Poker Tracker. 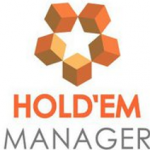 Even though Hold’em Manager counts among the most sophisticated poker software on the market, efforts have been made to design a clean and rather easy to navigate display. 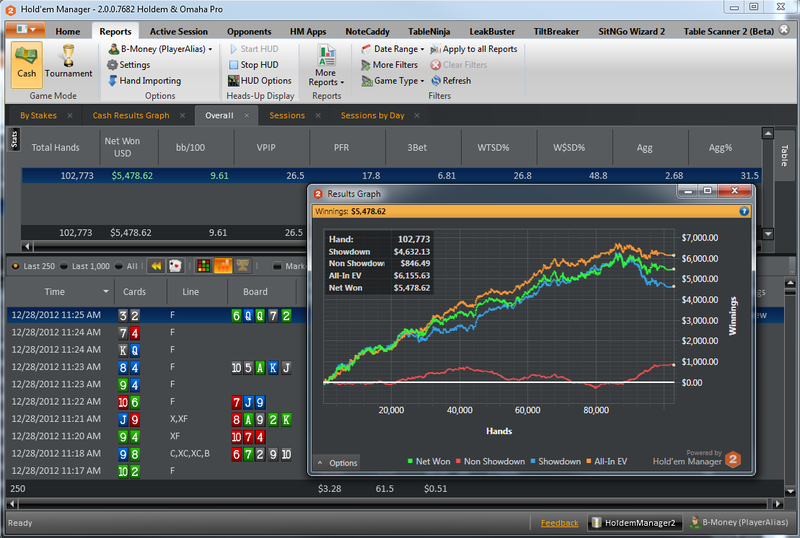 If you are still working your way around poker softwares, Hold’em Manager will be far simpler to use than Poker Tracker. To use Poker Tracker to its full potential, you will need to be an experienced player as the interface is pretty rudimentary and does not help to make the most of the statistics analysis. A good amount of clicking will be neccessary to access the information that you need, and even though the level of analysis provided is excellent, the interface proves a little too confusing for most players. This application takes useful notes based on hands – rather than statistics – to help you spot inconsistencies in the game. It reads your hands history and takes notes on your behaviour and your opponents to identify patterns. Just like any Heads Up Display, Note Caddy will appear on your poker room while you are playing to provide you advantageous insights about the game: You want to find out who has a tendancy to call continuation bets too often? Who plays draws aggressively? Note Caddy is the tool you need. 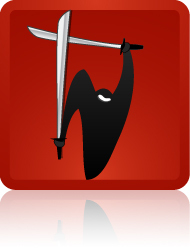 As its name indicates, Smart Buddy is a buddy detection software for online poker. It allows you to follow, in one window, all your friends from multiple online poker rooms and let you know when they are online. This is especially useful when you notice a player giving his money away (what poker players call a “fish”) and don’t want to lose tracks of it! Just add the player in your list to get notified every time he joins a poker room and find out on which site and exactly at what table he is playing. You can also add useful comments on your new friend to make sure you’re not missing out any of his money. Smart buddy is the go-to application for all the sharks out there. nce you are confident enough in your game, you can start playing on multiple tables at the same time to improve your hourly rate. If you reach that level, one tool can help you handle this challenge: Table Ninja has been designed to make your multi-tabling experience smoother. It allows you to get rid of many annoyances while playing, customize default betting amounts, manage your waitlist efficiently and organize your tables easily so you can always keep an eye on the action.